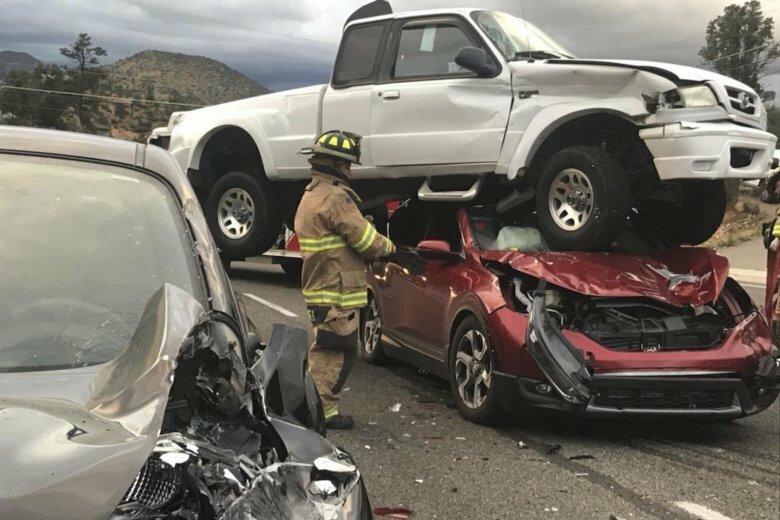 PRESCOTT, Ariz. (AP) — Authorities say a pickup truck landed on top of a car after the truck was hit by another vehicle and went flying through the air. The car was crushed but no one was hurt. Firefighters in the small city of Prescott north of Phoenix say it was amazing that the two people in the car and the woman driving the pickup were not hurt after the crash Sunday night. Prescott Fire Department spokesman E. Conrad Jackson said Monday that the pickup truck driver was hit by another pickup truck that came alongside her vehicle. The impact sent the pickup that was hit soaring and it landed on the car. Jackson says the driver who caused the crash fled. The occupants of the vehicles in the crash were wearing seatbelts.